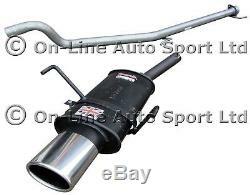 Astra H Mk5 2.0 Turbo (NOT VXR) Sportex Exhaust plus Race Tube System - Oval. This well engineered SPORTEX performance exhaust rear muffler and'silencer-less' performance exhaust'Race Tube' centre section fits as a direct replacement for the original centre & rear silencers. It bolts directly to the exit of the Catalytic Converter on all Astra Mk5 2.0 TURBO (NON VXR) 3 & 5 door models built in the period - June 2005 - Jan 2010. The SPORTEX Rear Silencer is manufactured from aluminised mild steel and features a polished STAINLESS STEEL Single OVAL tailpipe measuring 4.5" wide x 3" deep with an internally rolled tip. The Race tube is manufactured from 57mm diameter high grade aluminised mild steel, and provides a deeper more hollow exhaust note. A performance improvement is achieved by improving the flow through the system. NOTE: THE IMAGE SHOWS THE ACTUAL ASTRA MK5 1.6 TURBO SPORTEX REAR SILENCER + RACE TUBE. The item "Astra H Mk5 2.0 Turbo (NOT VXR) Sportex Exhaust plus Race Tube System Oval" is in sale since Friday, January 4, 2019. This item is in the category "Vehicle Parts & Accessories\Car Tuning & Styling\Performance Exhaust\Other Performance Exhausts". The seller is "on-lineautosport" and is located in Lichfield, Staffordshire United Kingdom. This item can be shipped to European Union member countries.